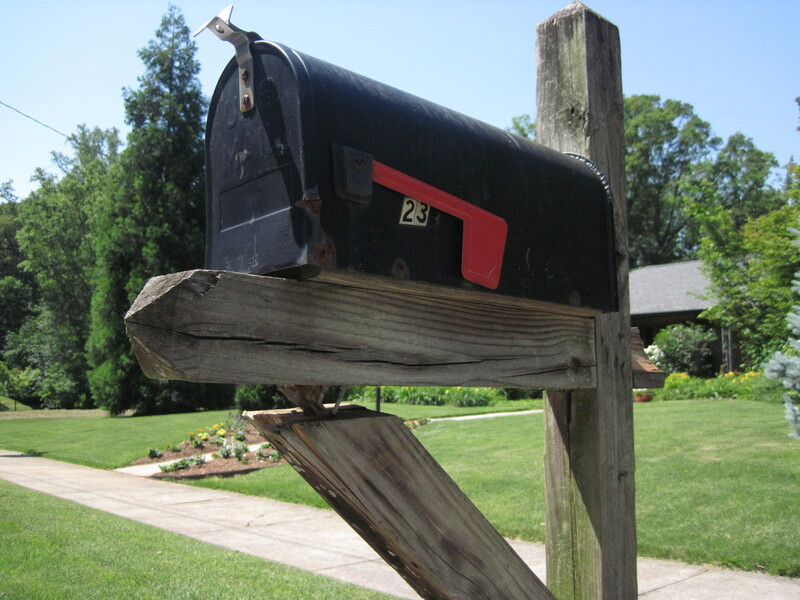 More Mailboxes Vandalized May 18-19 on E. Parkwood Rd. Mailboxes at 222, 239, 243, 250, and 254 were either knocked off their posts or the posts themselves were destroyed. 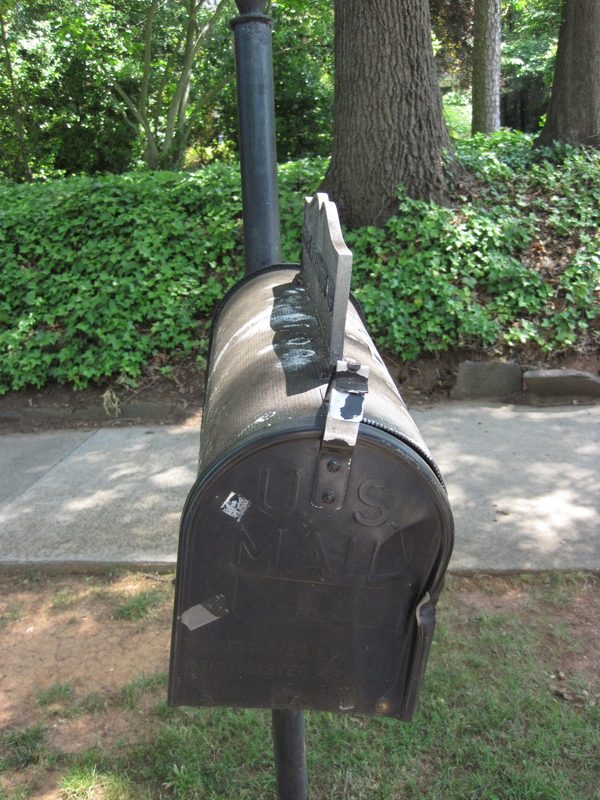 It is difficult to see what I think are hammer marks on the mailbox at 222 and 254 from the photos [see photos below]. Also Mac Sitton put the post back together before I could take the photo at 239. 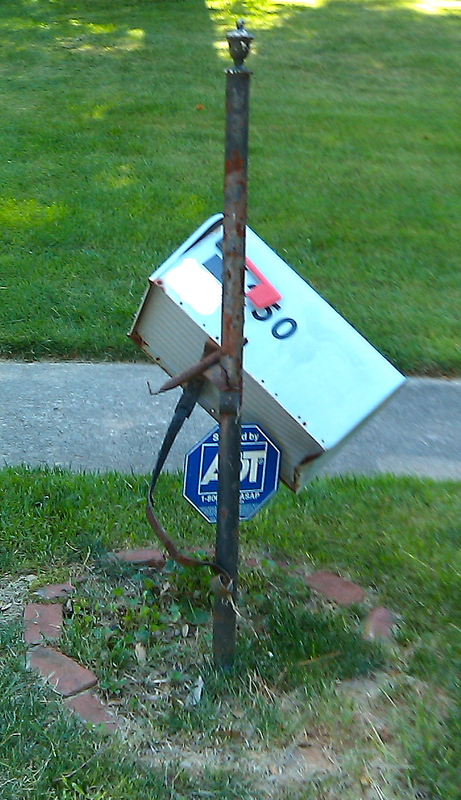 I am not sure if the mailbox was also destroyed at 235 but I believe it to also be a casualty of last night. 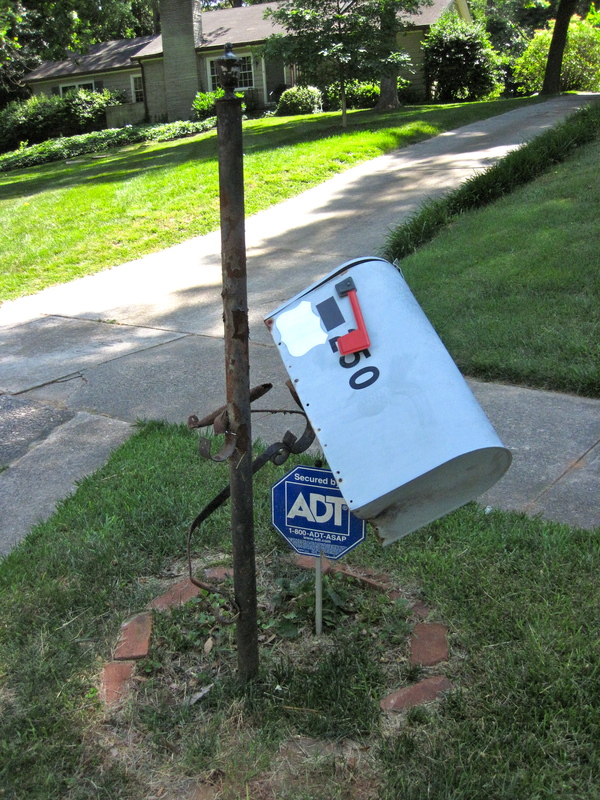 If so, it will be the 6th mailbox damaged for E. Parkwood Rd. Decatur police officers were called and filed a report. There were 3 officers who came out this morning. The one I spoke with was S. Batchelder. The case number is 1102346. I am checking with several of my neighbors, and no one heard anything during the night. Wednesday night, sometime between 11 p.m. and 6 a.m., my mailbox was completely knocked over — the wood upright was completely split in two. My neighbor’s mailbox at 243 E. Parkwood was knocked off its support and another two across and just slightly down the street were also knocked off their supports. Decatur police department took the report — very quick response for this non-emergency call and much appreciated. I nailed my post back together before I left for work until I can replace the whole thing this weekend or next. The box next to the Alshuts, Genie Treadway’s, is still down. She’s probably our oldest and longest Parkwood resident. The name of the Decatur police officer I spoke to was “A. Vote.” He probably needs to put his first name on the card. There was also a message on my machine from an Investigator Kelly this evening, but he was not in when I returned the call. This is all the information we are aware of as of Friday, May 20. 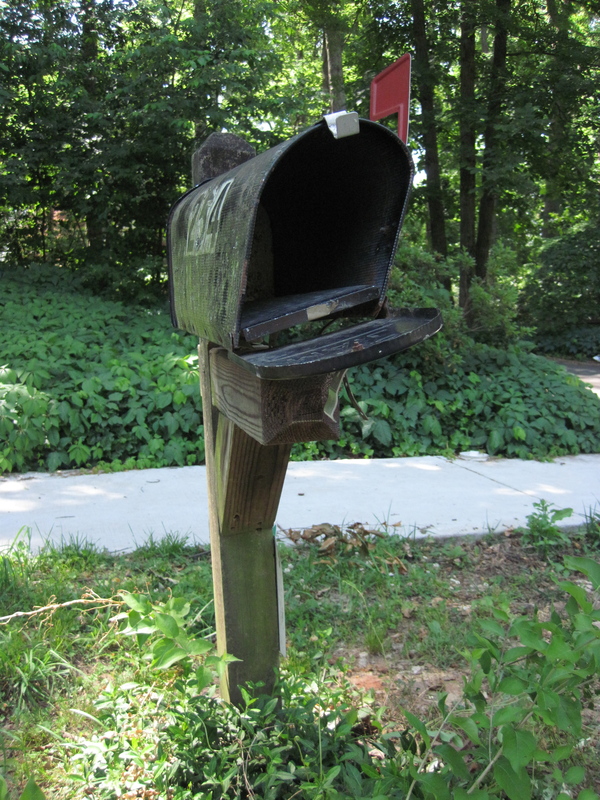 If any other PGC neighbors had their mailboxes damaged or would like to contribute any additional information, please leave a comment on this post for all to see. 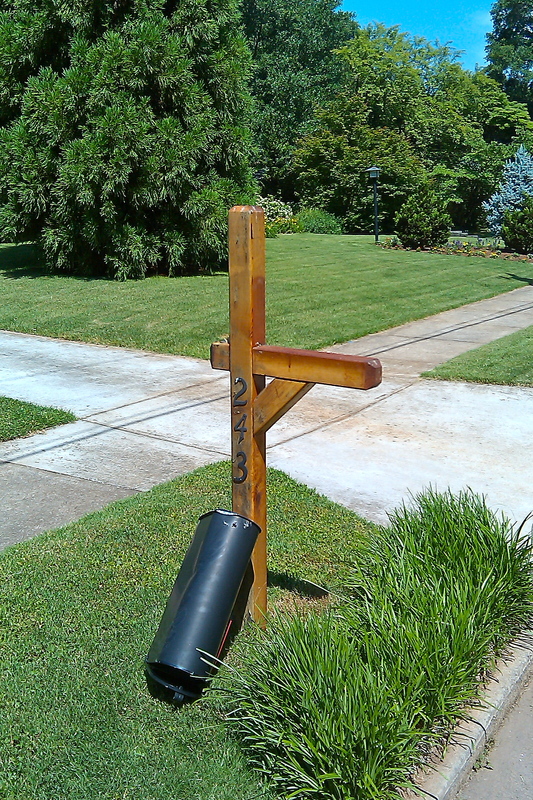 The photos below are of damaged mailboxes on E. Parkwood Rd. going from south to north on the street. In most cases the address is visible. Thanks to the PGC neighbors who have been contacting PGC Communications Chairs about crime in our neighborhood this week. We hope other neighbors will follow suit but also hope they won’t ever have to! This entry was posted in Alerts, Crime. Bookmark the permalink.